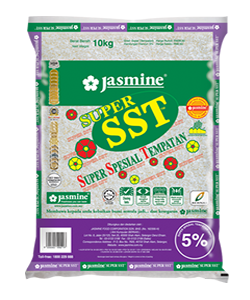 Local White Rice | Jasmine Food Corporation Sdn. Bhd. The overall market size of the Malaysian rice industry stands at about RM5 billion per annum. This includes all rice types. Of this market size, the local white rice category commands a hefty 60% of the volume. The leaning of consumers towards the local varieties reflects the level of comfort they have on local white rice which are more affordable because of its pricing that is regulated by the government. Local white rice is divided into various sub-categories, with 5, 10 and 15 percent broken-rice categories. They are marked by a purple band. The various levels of broken rice inside a pack reflects the quality and flavour of the rice. Usually the higher the level the less enjoyable it becomes. 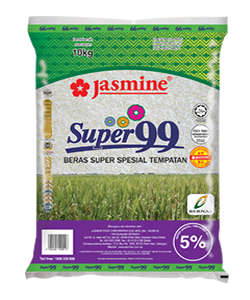 Jasmine’s Super Special, Super SST, Super 99, Super 77 and 1 Super rice are of the 5% broken-rice category. They are processed from padi stocks sourced through Jasmine’s own mill as well as from other rice millers. Because of its affordability, there is a huge demand for local rice varieties. 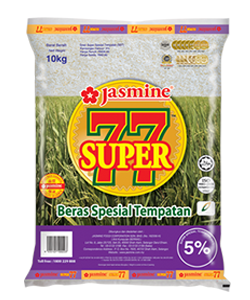 Jasmine local rice is processed and undergoes stringent quality standards. These include destoning, colour-sorting and then auto-packing through automation for hygiene. Jasmine rice products also carry a Money-Back Guarantee. In the event you are not entirely satisfied with your purchase, you may return your purchase for a full refund*. Usage: For home and restaurants, nasi lemak, fried rice & banana leaf rice.